Bonus Information: 100% welcome bonus up to £200 plus 25 free spins is available. Not available for table games! 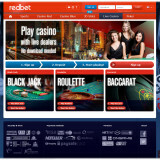 Redbet have 2 online live casinos that each offer live blackjack. Their Evolution live casino offers 7 seat and VIP blackjack tables with a betting range of between £5 and £5000. Their Net Entertainment casino offers common draw blackjack (known as unlimited blackjack elsewhere), with stakes ranging from £5 to £500 per hand and 7 Seat Blackjack with stakes from £25 to £5,000 a hand. As you might suspect the games at both the casinos are not quite the same. I’ve listed the games features on the grid below. What’s it like to play at Rebet? 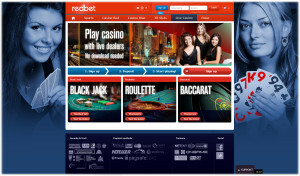 Redbet online casino has been established since 2002 and is owned by a Swedish Company called Bonnier Group AB. They hold a casino license from Malta and have become an established and trustworthy casino across the online player community. I began playing here on the recommendation of others and because I wanted to play blackjack at a Net Entertainment live casino. When I initially explored the site I found that there were actually two Live Casinos being offered, one of a few casinos reviewed on Liveblackjacksites that do this. 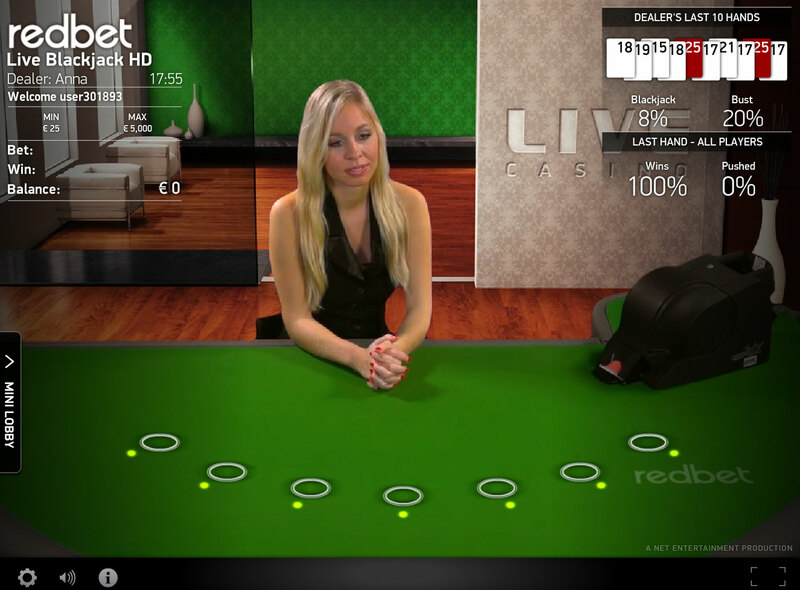 An Evolution software based live casino, with its dealing rooms in Latvia, offering a choice of tables with various ranges of stakes and a Net Entertainment live casino operating from Malta. Having reviewed them both I now understand why they have two live casinos. The Evolution casino offers traditional 7 seat blackjack tables, which can fill up when it’s very busy and you can struggle to get a seat. So Redbet offer an alternative which is the Net Entertainment live casino. This offers both Common Draw Blackjack, which allows an unlimited number of players to play using one hand and standard 7 Seat Blackjack. This means that you will always be able to get a game at Redbet no matter how busy it gets. Good for them and good for us! The Evolution Software interface is one of the better ones that I’ve used. The initial lobby page is functional, not very inspiring, but lays out the tables, betting limits, and available seats in a straight forward manner. Clicking on a table loads up the playing interface, where you can chose to watch or click to take a seat. You will notice that the 3D view is uncluttered. All of the controls are laid out nicely along the bottom of the screen. You can adjust the screen aspect and resolution and whether you want to see other players chat. Your hand history is available but you can’t see the dealers or other players previous hands. The dealers are chatty and speak good English. 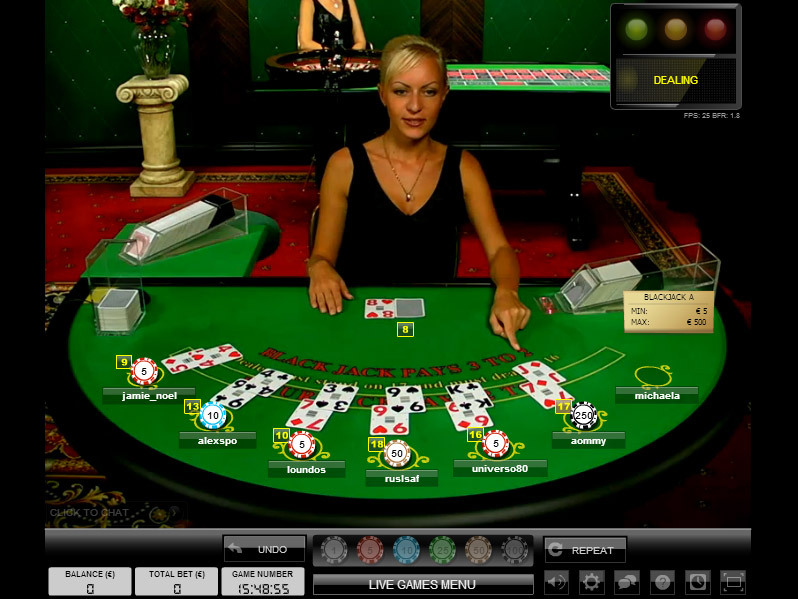 The cards are dealt from a transparent shoe and are shuffled by the dealer when approximately half the decks have been dealt. 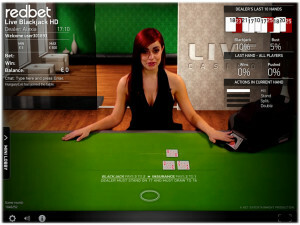 The Net Entertainment solution is the most modern looking live casino that I have come across. The dealing room has been styled in a very modern way and the playing interface is no different. Lots of information is available to the player. You can see details of the 10 previous dealer hands. Your hand history is also available through a pop out screen. The Net Entertainment solution offers two games. Common Draw blackjack, where many people bet on the one hand and standard 7 Seat Blackjack. Both games use 6 decks and are dealt from a Shufflemaster dealing shoe. The used cards are recycled into the machine after each hand. I’m not overly keen on playing with these shoes, as it’s a small step away from the traditional dealer / manual card shuffle model that I prefer. This is not just an online thing for me, I don’t like it in land based casinos either, but I don’t mind the independent shuffling machines being used as long as the cards come out and are dealt from a shoe. There are minor differences between each of the Redbet Casino Live blackjack products and they can be seen on the table above. The major difference is the Evolution casino has a comprehensive set of Blackjack Side Bets (Bet Behind, 21-3 and Perfect pairs). If you’re interested in other casinos that have side bets that don’t use Evolution software checkout my reviews of Fairway Casino or Bet365 as these are good alternatives. A range of deposit and withdrawal methods are provided that should suit most people. The list includes, IBAN, Instant Bank, MasterCard, Neteller,Nordea, Paysafecard, Przelewy 24, Skrill, Swedbank, Visa Credit, Visa Electron and Web Money. Cash outs are quick, normally within 24 hours. A 100% welcome bonus up to £200 plus 25 free spins is available, but unfortunately it is not available for table games. Support is provided with online chat between 09:00 am – 01:00 am (GMT). Email and telephone support are also available. My experience has been pretty good with the online chat support people, I’ve only really used it to answer queries. Things like password resets can be done without support and there is an added security feature that removes your credit card details from your account when you reset your password. A nice, secure touch. It’s great to have the choice of two live casinos. I liked the feel of the Net Entertainment casino, it was fun playing there, but longer term my heart is with the Evolution live casino. Redbet is about as safe as you can get online. With a great reputation among the player community it is certainly one to have on your list of favourites.